Hitler's Foreign Policy & the Causes of World War II. Adolf Hitler was born in Austria in 1889. As a young man he wanted to become an artist, but he was rejected from the Vienna Academy of Fine Arts. He was a strong supporter of German nationalism and developed a hatred of Jews early on. He joined the German Army during World War One. After the war, he joined the German Workers' Party. 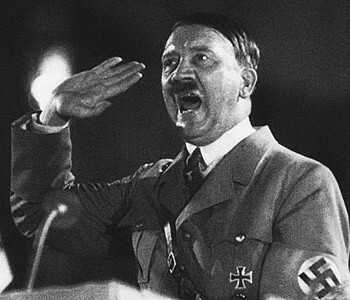 He became its leader and renamed it the German National Socialist Party, otherwise known as the Nazi Party. In 1924, the Nazis attempted to grab power by staging a putsch (coup) in Munich. They failed and Hitler was arrested and imprisoned. While in jail, he wrote his ideas about Germany, propaganda and the Jews down in a book called Mein Kampf (My Struggle).Not long after he was released from jail, the Great Depression crippled the German Weimar Republic. Unemployment rose to 6 million. Hitler and the Nazis became more popular and they were elected as the largest party in the Reichstag in 1933. President Hindenburg invited Hitler to become Chancellor of Germany. Hitler set about creating a totalitarian dictatorship: the Enabling Act allowed him to rule by decree and he used propaganda to create a cult of personality around himself. When Hindenburg died Hitler combined the offices to President and Chancellor to create the title of Fuhrer (leader). He put down opposition to his rule during the Night of the Long Knives, terrorised Jewish citizens with the Nuremberg Laws and Kristallnacht and attempted to combine the German Protestant churches into a unified Reichskirche. Hitler's foreign policy was very aggressive. He won power by promising to destroy the Treaty of Versailles, and he broke it by rearming the German army, remilitarising the Rhineland, and joining with Austria (Anschluss). In 1938, Britain and France allowed him to annex the Sudetenland from Czechoslovakia. Within a year, he had invaded the rest of Czechoslovakia and invaded Poland. This caused the Second World War. During the first years of the war, Hitler enjoyed many successes: he invaded and conquered Poland, Norway, Denmark, Belgium, the Netherlands and France, as well as beginning to invade Russia. After 1942, however, he began to suffer defeats as the Allies defeated German forces in North Africa, Stalingrad and eventually from France. Hitler retreated to a bunker in Berlin, where he stayed until the Soviet Red Army reached the city. Rather than be captured, Hitler committed suicide in the bunker. born in Austria, wanted to be an artist, hatred of Jews, served German army in WWI. Joined the German Workers' Party, became its leader, renamed it the National Socialist (Nazi) Party. Munich Putsch 1924 - failed, Hitler imprisoned. Wrote Mein Kampf. Great Depression affects the Weimar Republic, Nazis become more popular. 1933 election, Hitler becomes Chancellor. Enabling Act, cult of personality, propaganda, Fuhrer. Night of the Long Knives: Rohm killed,opposition put down. Treatment of the Jews: Nuremberg Laws, Kristallnacht. Reichskirche - unified German Protestant church. Breaking the Versailles Treaty: rearmament, remilitarised the Rhineland. Munich Conference: Annexed the Sudetenland. Invaded Czechoslovakia and Poland, started World War II. Initial successes: most of Europe under Nazi control by 1941. Allies push back in 1942, Nazis defeated in several areas. Soviet army invades Berlin, Hitler commits suicide. 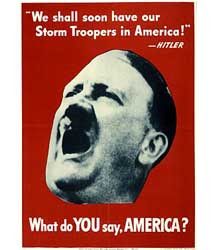 American recruitment poster featuring Hitler.